Easy Step IV gives your pet the freedom to access beds, couches, and automobiles with ease and relieves you from any heavy lifting of your precious pet. 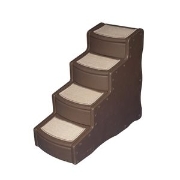 Our steps are wider and deeper making each landing easier to use for any size pet. Each step has a slight incline to reduce the amount of steps your pet must step up. The Easy Step IV is a lightweight portable set of steps that can accommodate pets up to 150 lbs. but weighs only 15 lbs! Measures 16" wide x 30.5" high when assembled (ships apart and snaps together). The carpet removes for easy cleaning. 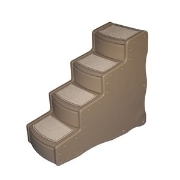 Larger Steps: Keeps your pet sure-footed. Easy Set-Up: Snaps together in seconds. Removable Carpet: For easy cleaning. Rubber grips: Helps prevent steps from slipping on hardwood and tile. Supports pets up to 150 lbs. Note: This item is shipped directly from the manufacturer. All warranties or returns are directly through Pet Gear Inc. Pet Gear products can only be returned during the first 30 days only if the product was manufactured poorly, or the wrong product was originally sent.